My Mizuno Wave shoes have seen their course. They maintained their comfort throughout 18 months of use but their grip finally faded and the outsides were FUBAR! I've bought some new Butterfly shoes... and almost immediately I'm finding fairly huge problems in my lower left back, my left-side IT band and left heel. This *could* be coincidence, as I'd been doing "House Tug of War" at school that week, but I suspect it's the shoe. So, my question is, what can I do? I've worn the shoes now so I doubt I can take them back. Would an insole do the job? If so, what type do I need to buy? Mate of mine got some butterfly shoes in from japan before the restrictions got enforced. He was disappointed in them although they were light. If your older shoes are working better for you why not go back to them. I have considered recently getting a pair of discounted stiga instinct shoes from contra.de which are supposedly based on the mizunos. If you were looking for a beefier pair of shoes to train in the asics gel cyperspeed are excellent but a little heavy for competition. I'm currently using a set of asics excounter with gel inserts called sof sole airr - they also do a airr slim but they don't give the same protection. The heel in the airr model only last around 3-6 months since I stomp a bit. 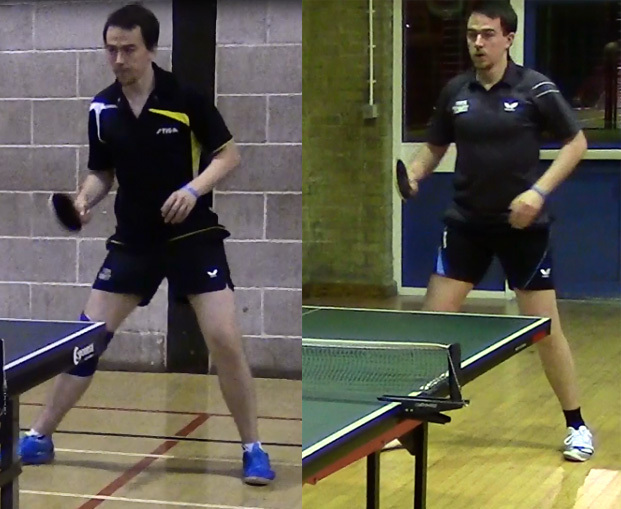 Suggest have 2 pairs - one for training & using the lighter pair for competition where you have less protection. I stupidly binned the old ones before checking to see if the new ones were any good Never really had problems with trainers so didn't even think about it! That new left shoe does not look good. If you can't lace them tighter, you risk injury (don't tighten so you stop the bloodstream). Is there an extra pair of lace holes you haven't used? Perhaps use a lacing pattern that tightens better over the forefoot. There may be heel cup inlays that push your foot forward a little so the shoe fits better. Fortunately, I've found my old shoes in the cupboard. Looks like I didn't throw them out after all! I've decided just to give up on the shoes that are too big; I'll sell them on eBay. I've ordered a new pair of the same shoes (different colour) in the same size that I know fitted my really well. I have always found TT shoes too light and do this - maybe build for lighter people! I go for squash shoes - the lighter ones, Mizuno Wave are fab, and Asics Gel are also excellent - slightly heavier than Mizuno....I save the Mizuno for matches, and the Asic Gels for training / coaching - I like switching to the lighter feel for a match, and makes them last longer. Sorry to reply to an old thread, but looks like I am facing similar problems and so looking for a good advice. I have been playing recreationally for a long time before I started training quite recently with a coach. My problem got aggravated by trying to learn the proper footwork during training sessions. The coach mentioned that I needed proper shoes because the joggers that I have are not good for a lot of side movements. Now the problem are my sore toes, outer side, where bone sticks out a bit. Got them sore and sometimes blisters even though my old joggers are very soft inside. How to get right shoes with this problem? Buying online seems a bit unreliable. I am just not sure if the tt shoes are tough inside and my joggers are soft will i get more problems? Years ago I heard or read about shoe exchange networks, for people who have different sized feet. They match you up with others who have the opposite feet with the same sizes so you can arrange to exchange shoes. The way it actually works, I think, is that the two of you would agree on a pair of shoes, one of you will buy two pairs in the two different sizes and ship the ones the other guy needs to him, and he'll pay you for the pair. Don't have any details, if these things still exist they'll be on the web somewhere. Sounds dodgy Isk. How can you guarantee the 2nd guy pays for his pair? You could get stuck with an odd pair that would neither fit you or almost anyone else. What? It's really a thing! I bet they could find a wider audience with a smartphone app, though. It would be like a Tinder for shoes. They could call it "TinderFoot". Sorry. Don't know - and I heard about this back before web sites were common. Maybe you were supposed to write a few letters to build up trust first? Or maybe there was a central broker? Or maybe everyone just trusted each other. But it sounds like a great solution to what must be a fairly common problem. Imagine having to accumulate, over the years, odd-sized pairs of shoes you couldn't wear because they fit the opposite of your feet. I suppose, once you've traded shoes a couple of times with someone, you'd probably have a friend for life! Actually, if you think about it.. the alternative would be for each one to buy a pair of shoes and ship the one that doesn't fit to the other guy. Imagine the bother of finding matching shoes in different cities, and all the things that can go wrong! Having a look at those websites - I see there's another group of people who use the service - amputees. Quite a good idea, indeed. One's been around since WWII! I am sure this is what I heard about years ago. Did anyone have problems with sore toes and how that affected their choice of shoes?